Building Science Corporation has worked with project teams on a wide variety of masonry retrofits, from houses to large buildings, including historical buildings that are North American landmarks. 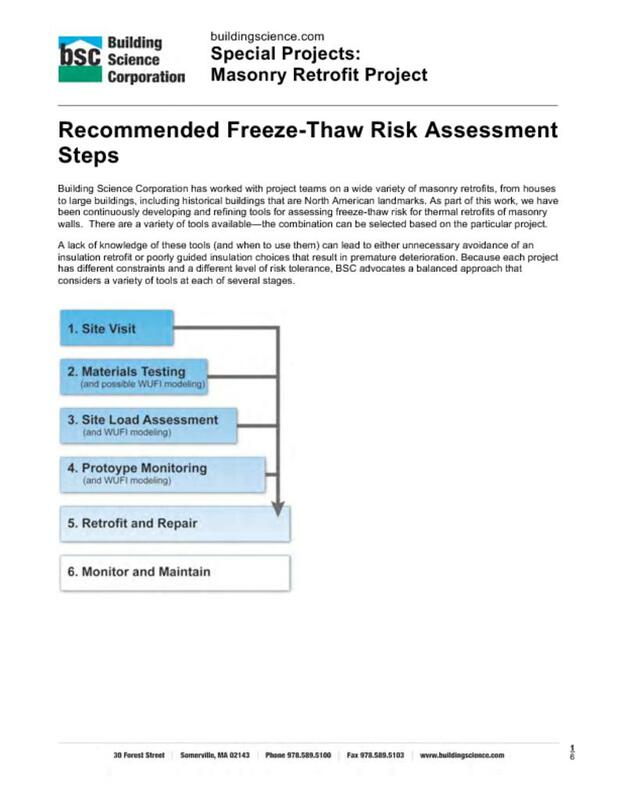 As part of this work, we have been continuously developing and refining tools for assessing freeze-thaw risk for thermal retrofits of masonry walls. There are a variety of tools available—the combination can be selected based on the particular project. A lack of knowledge of these tools (and when to use them) can lead to either unnecessary avoidance of an insulation retrofit or poorly guided insulation choices that result in premature deterioration. Because each project has different constraints and a different level of risk tolerance, BSC advocates a balanced approach that considers a variety of tools at each of several stages. For more details, click on the diagram below.